After arrival at Basel-Mulhouse airport we travel by road (1 hour 20 mins) to the outstandingly picturesque small town of Obernai, with its narrow streets, ancient houses and delightful main square. We stay at a 4* hotel in the town centre. We walk to explore the delightful little town of Obernai, then drive 15 minutes to the wooded hills of the Vosges, and walk to the picturesque convent of Mont Ste Odile, with panoramic views across the Rhine Valley, before returning for a second night in Obernai (9.6 miles/5 hours). We drive 20 minutes to the walled village of Dambach-la-Ville, its fortified gateways and towers set amongst vineyards. We visit its streets of ancient houses then follow paths through vineyards across a small valley and walk up to the landmark Castle of Koenigsbourg, before descending through forest to the village of St Hippolyte, set amongst vineyards against the wooded hills . Our hotel is set amongst vineyards (13.2 miles, 6.5 hours). Paths through vineyards and forested hills lead to the small town of Ribeauvillé, famous for its Traniber and Riesling wines. After exploring the town, we continue through woods and vineyards to the village of Riquewihr, with its perfectly preserved streets of ancient houses (12.4 miles, 6 hours). After ascending through woods we reach a ridge with fine views, which we follow until lunch. We then descend and follow farm tracks to Lapoutroie, set amongst meadows (12.2 miles/6.5 hours). Free day in Lapoutroie (1,145ft) with an optional walk up through pastures (to 3,995ft), where we follow a ridge to ‘cirques’ with lakes and meet the Tour Manager for a lakeside lunch. We then continue to Gazon de Faing (4,267ft) (8 miles, 4 hours). We walk up through meadows and small villages to a medieval sanctuary, before descending along an ancient pilgrim path to historic Turckheim. After visiting the village we follow paths across the hills to the small picturesque town of Kaysersberg, set amongst renowned vineyards (10.3 miles, 5 hours). We enjoy a farewell dinner at our hotel's 2* Michelin restaurant. Return to Basel-Mulhouse airport (1 hour). If you would like an extension booking at either end of your trip please indicate this during the booking process and we will contact you with pricing information. Walking in Alsace will be along farm and forest tracks through vineyards, forests and high meadows. Quiet lanes through picturesque villages, and pilgrimage routes. The fitness level of this walking holiday is Grade 3-4. Alsace is famous for its cuisine, and the area visited has the greatest concentrations of high-quality restaurants in Europe. These offer a range of different styles of cuisine from robust country cooking to Michelin-starred haute cuisine. The walking is great - with food and wine to match! A wide range of grape varieties from Riesling to Pinot Noir produce distinguished wines of character and interest. Do the hotels have WIFI, laundry service, hair dryers? 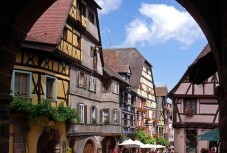 The Alsace region is gorgeous and this trip takes in the highlights of this beautiful, Alpine-like part of France. We stayed in charming, colorful villages and towns, walked through vineyards, forests, and high country with vistas for miles, visited ancient castles, and enjoyed the delicious wines and cuisines of the region. Superb trip in every way! This trip really had everything. The scenery was outstanding, there were a lot of points of interest, and I do not have words for the food and wine. Oh and the group was great fun as well. Thank you ATG and our two leaders for another great trip. Great variety. I enjoyed the daily differences. 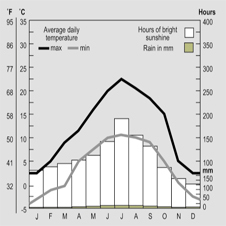 Meteorological records for the Alsace region of France, taken over a period of more than 10 years, are represented in the Weather Chart provided with each itinerary. Sheltered by the Vosges mountains, Alsace is one of the driest regions of France (Colmar has just 550 mm of rain per year!). Though its winters are harsh, summers are hot and dry with plenty of sunshine, and breezes from the hills. Spring is also extremely pleasant -those walking the higher routes should bring extra layers as it can be chilly in some parts in to summer. Autumn, which often enjoys an Indian summer, brings brilliant colours to the vineyards and forests, and intriguing mists on the plains. appropriate to the given day's itinerary. 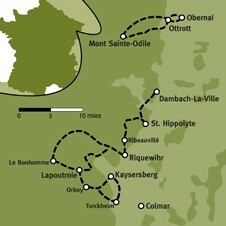 The Tour Leader will tell you each evening about the following day's walking options. This is an 8-day walking holiday, with walks offered on 6 days. The length of each day varies from 4 to 8 hours of walking. Hours of walking, which may vary from individual to individual, means hours of actual walking and does not include stops for lunch, sightseeing or rests. The walking is through vineyards, meadows, along forest and farm tracks, on quiet country lanes and pilgrim tracks, and on the higher sections of the route across rolling hills. You will need walking boots with firm ankle support, and we recommend you bring walking sticks and layers for the higher elevations. 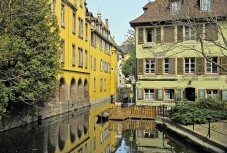 The destination airport for this walking holiday in France is Basel-Mulhouse. There will be a set meeting time at Basel-Mulhouse for the transfer to the first hotel; a set time for the return transfer to the airport at the end of the trip; and a 'recommended flight' to connect with the airport transfers. Booking the recommended flight - which we strongly encourage - guarantees transfers to and from the airport, irrespective of flight schedule changes or delays. For clients not on the 'recommended flight' we cannot guarantee a transfer from the airport should you be delayed for any reason in meeting the group at the specified place and time. In this instance you will have to make your own way to the first hotel, at your own expense. The transfer to the airport at the end of the trip will also be timed according to the recommended flight and we cannot offer transfers at alternative times. Please check with the Reservations Team before making independent arrangements. Hotel Le Parc, 169 Route d'Ottrott, 67210 Obernai, France. +33 3 88 95 50 08.
potato and meat stew marinated and slow-cooked in wine: and flammekueche or tarte flambée, a sort of pizza made with crème fraiche, onions and bacon. Alsace is also one of the world's chief producers of foie gras, which was invented in Strasbourg; and Muenster is one of the well-known regional cheeses. The area is also renowned for its desserts - dense cakes, custard tarts, spicy biscuits and apple strudel. 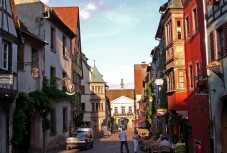 beer-producing region of France, with breweries in and around Strasbourg producing several major names, including Kroenenbourg, Karlsbrau, Fischer and Heineken. All evening meals are included and are taken either in the hotel or in local restaurants. We eat at a variety of restaurants offering a range of different styles, from robust country cooking to Michelin-star haute cuisine. For most restaurants smart/casual attire is appropriate, however there are some smarter restaurants where a jacket for men and dress/skirt for women would be appropriate. At dinner the Tour Manager will tell you about each evening’s menu and if there is anything else that you would prefer, you only have to ask. 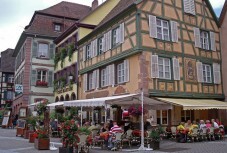 The destination airport for this walking holiday in France is Basel-Mulhouse. There will be a set meeting time at Basel-Mulhouse for the transfer to the first hotel; a set time for the return transfer to the airport at the end of the trip; and a 'recommended flight' to connect with the airport transfers. Booking the recommended flight - which we strongly encourage - guarantees transfers to and from the airport, irrespective of flight schedule changes or delays. For clients not on the 'recommended flight' we cannot guarantee a transfer from the airport should you be delayed for any reason in meeting the group at the specified place and time. In this instance you will have to make your own way to the first hotel, at your own expense. The transfer to the airport at the end of the trip will also be timed according to the recommended flight and we cannot offer transfers at alternative times. Please check with the Reservations Team before making independent arrangements. You are of course welcome to meet the group at the first hotel. Please indicate your intention during the booking procedure.